Scroll down if you are looking for my Countdown to Confetti post. I created a masculine birthday card this week, actually more specifically a card for my hubby who had a birthday on the 5th. He got his card a bit early as he left last Friday to head back to Edmonton for a couple of months. I focused my design on the embossing with just a clip and a sentiment in the corner. 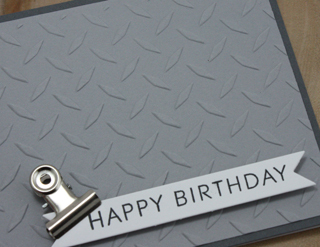 Your metal clip is just the perfect finishing touch to this clean and simple card! This is amazing - so simple yet still full of interest! this is too cool.. love the embossed background. Two words about your card; AWESOME!! LOVE!! Your husband's in Edmonton for two months? That's a long time away, but he's in my home city!! I'll be heading that direction on the weekend for my nephew's baptism. Excited!!! Love this Tracey and you even have metal on it! Happy Birthday to you Husband! Like what you did with that embossing folder. I always take it out, go hmmmmm, and put it back. What was I thinking! Talk about CAS--this one takes the cake. Glad to hear that this card was hand delivered, since I was wondering how you'd get that clip into the mail. I'm sure James loved this card. 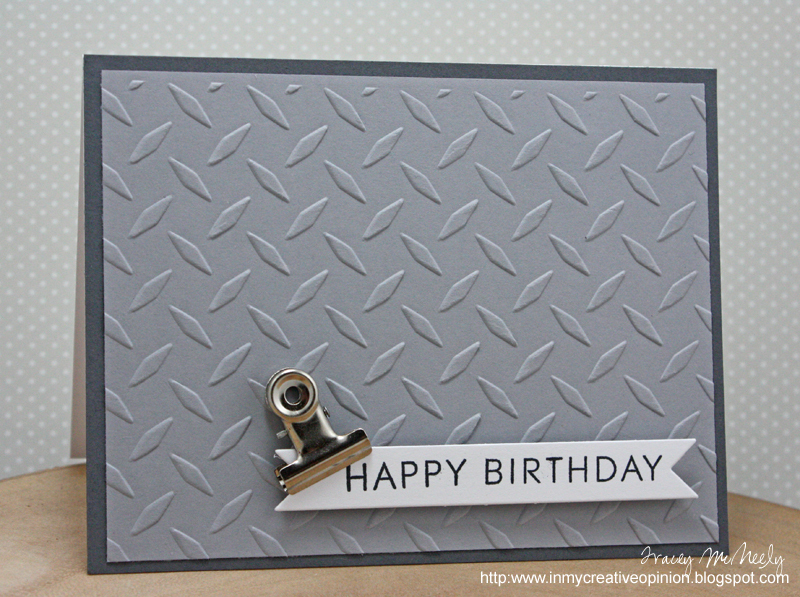 I forgot all about that embossing folder--love that one, and it is so perfect for a masculine card. CAS beauty Tracey. I have no doubt your hubby loved it. Clever & creative--great use of the cue word! Happy Birthday to your husband! This is a wonderful masculine card! I'm sure your husband appreciated it! I must have missed this fabulous card when I stopped in earlier...what an amazing take on the Cue Card, Tracey! I love the masculine feel of your design and the metal clip is really cool! I'll bet your hubby loved it! What a great masculine card! Love the embossing and very cool clip! Great masculine card...love the fab texture! Perfect interpretation of the cue word, Tracey! this my friend is brilliant! hummm… this cue has my wheels turning with ideas… heavy metal anyone? Too cute! I love your metal too. What a fun embossing folder. Love that embossing! Such a perfect masculine card! 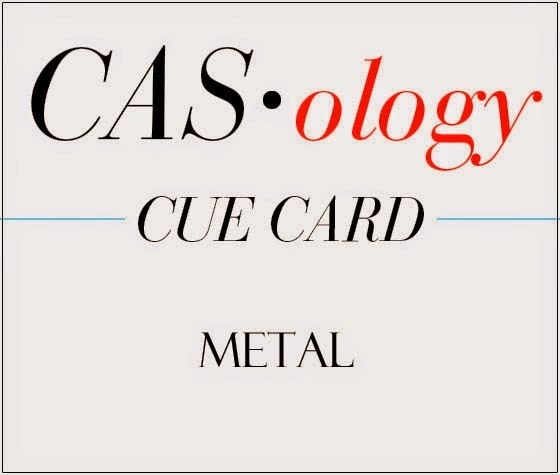 Brilliant take on the cue...perfect metal clip and very cool embossing folder effect!